Have you checked out my review on the MAM Pod? If not you can find the review here. MAM is a company who asked me to review some of their products when I was still quite new on the blogging scene, I am delighted MAM still want to work with me a year on and that they are apart of my big blogaversary! To celebrate my blogaversary MAM have provided me with 3 different MAM sets each containing two items for 3 of my lucky readers/visitors to win! This competition is for set THREE, the set contains the following below and is worth £12.89. 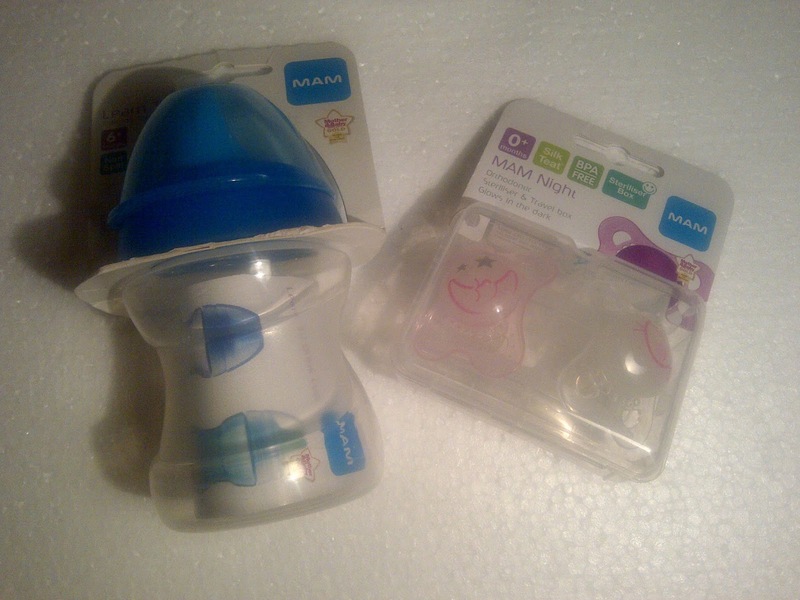 The MAM night soothers are suitable for ages 0months+ and contains two pink soothers. The soothers are orthodontic, glows in the dark and also come in a steriliser and travel box. The soothers have curved shields for comfort, good for the skin thanks to air holes and MAM's unique inside surface. The teats are MAM's patented silk teats, they are silky soft, no other silicone feels softer. Thanks to the anti-spit surface the soothers stay in your babies mouth. The soothers functional design, MAM orthodontic teat is ideal for babies jaws and teeth development. Thanks to the smart design & wide variety of sizes, the soothers fit perfectly in your babies mouth ensuring maximum comfort. The learn to drink cup is suitable for ages 6months+, the teat is soft and therefor ideal for the transition from breast or bottle to training cup. The learn to drink cup is non-spill, the MAM valve keeps liquid in when not in use, and yet is easy for babies to drink from. The narrow waisted cup with the innovative cutout is especially easy for babies to hold. The cup has won a Mother & Baby gold award for excellence.